Digital Forensics for Legal Professionals is a complete non-technical guide for legal professionals and students to understand digital forensics. In the authors’ years of experience in working with attorneys as digital forensics experts, common questions arise again and again: "What do I ask for?" "Is the evidence relevant?" "What does this item in the forensic report mean?" "What should I ask the other expert?" "What should I ask you?" "Can you explain that to a jury?" This book answers many of those questions in clear language that is understandable by non-technical people. With many illustrations and diagrams that will be usable in court, it explains technical concepts such as unallocated space, forensic copies, timeline artifacts and metadata in simple terms that make these concepts accessible to both attorneys and juries. The book also explains how to determine what evidence to ask for, evidence that might be discoverable, and furthermore, it provides an overview of the current state of digital forensics, the right way to select a qualified expert, what to expect from that expert, and how to properly use experts before and during trial. With this book, readers will clearly understand different types of digital evidence and examples of direct and cross examination questions. It includes a reference of definitions of digital forensic terms, relevant case law, and resources. 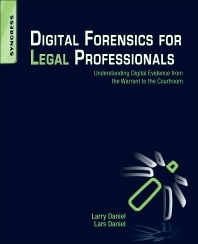 This book will be a valuable resource for attorneys, judges, paralegals, and digital forensic professionals. 1.1 What is digital forensics? 1.2 What is digital evidence? 4.1 Who establishes best practices? 4.2 Who should be following best practices? 5.1 What makes a tool forensically sound? 5.2 Who performs tool testing? 7.1 Why hire a digital forensics expert? 9.1 What is an expert? 31.1 What is web caching? 31.4 What if the Internet cache is cleared by the user? 34.2 E-mail storage and access: Where is it? 36.1 What is peer-to-peer file sharing? 39.2 What is a database? Larry Daniel is a digital forensics examiner and cellular records analyst with Guardian Digital Forensics. Larry has testified over 45 times in state and federal courts, and is one of the top digital forensic examiners in the US, with experience in hundreds of civil and criminal cases involving all types of digital evidence, from computers to black boxes to cell phones. Larry is a sought-after speaker for both technical and legal conferences, and is the co-author of the successful Syngress title Digital Forensics for Legal Professionals.